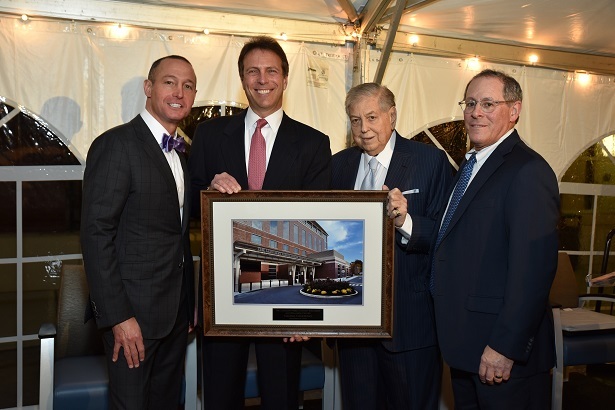 Pictured from left, Warren Geller, CEO and President of Englewood Hospital and Medical Center, Jay Nadel, Chairman of the Englewood Hospital and Medical Center Foundation, Ronald Lefcourt, Englewood Hospital and Medical Center benefactor and local businessman, and Thomas C. Senter, Esq., Chairman of the Englewood Healthcare System and Englewood Hospital and Medical Center. November 17, 2016 — Englewood Hospital and Medical Center unveiled the name of its new cancer center, The Lefcourt Family Cancer Treatment and Wellness Center, on November 16, and recognized local businessman and philanthropist Ronald Lefcourt for his support of the medical center’s mission to bring high-quality, humanistic cancer care to the region. Mr. Lefcourt, president of Alliance Shippers Inc., headquartered in Englewood Cliffs and one of North America’s premier, privately owned global logistics and transportation companies, made a lead gift to the medical center’s capital campaign, Transforming the Future: Our Campaign for Englewood Hospital and Medical Center. The gift brings the total amount raised in the campaign to $42 million, within reach of its $50 million goal. “We see ourselves as a partner in our patients’ healthcare. Thanks to the generosity of Mr. Lefcourt, our patients and our community will benefit from a stronger clinical team, new services and programs, enhanced diagnostics and treatment, all centered on the humanistic care our patients expect,” says Warren Geller, president and CEO of Englewood Hospital and Medical Center. Established with support from Transforming the Future, The Lefcourt Family Cancer and Treatment Center represents a new standard for cancer care, where patients are treated as guests with amenities to ensure a comfortable and convenient experience. The 185,000 sq. ft. facility houses all cancer services and specialists in one location, minimizing patient anxiety and making for a smooth, seamless transition from one area to another. The cancer center offers a multidisciplinary care approach, bridging nationally recognized specialists, empathetic clinical staff, advanced technology, and comprehensive services together to create tailored plans for the diagnosis, treatment, and prevention of cancer. “The Lefcourt Family Cancer Treatment and Wellness Center offers a personalized approach to cancer care that is built around each individual’s unique needs, with special attention given to caring for the whole body and addressing the needs of the patient’s family,” says Steven Brower, MD, medical director of The Lefcourt Family Cancer Treatment and Wellness Center. Patient diagnostic and treatment services include advanced breast imaging using 3D mammography, laser-focused detection of cancer using a 3T MRI machine, robotic and minimally invasive surgical techniques, TrueBeam radiotherapy system for a more precise treatment and quicker recovery, precision medicine and infusion therapy to target cancer on a molecular level, cancer risk assessment, access to clinical trials and research, integrative medicine to reduce symptoms and enhance quality of life, and support groups and other services. Carefully considered design elements from soft lighting to spa-infused features to comfortable furniture and private infusion rooms make for a relaxing space for patients to receive treatment, and where family and friends are encouraged to participate in ways that help their loved one heal. The cancer center has been designated as a Comprehensive Community Cancer Program by the Commission on Cancer of the American College of Surgeons.